MANILA, Philippines - Eleven suspected drug pushers in Tanauan, Batangas took the “walk of shame” in a Santacruzan-like event on Monday, May 23 upon the order of Mayor Antonio Halili. 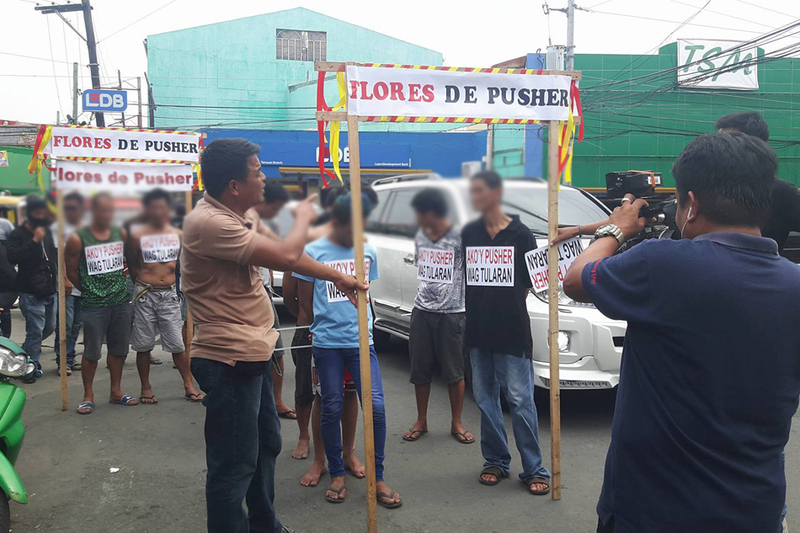 According to a report by Balitanghali, the alleged illegal drugs pushers were brought to the Tanuan City Hall grounds to be paraded in the shame campaign. A formal complaint was being drafted against them during the incident. The suspects, bearing the signs that say “Ako'y drug pusher, 'wag tularan,” were made to walk under a bamboo arch with the sign “Flores de Pusher,” a play on the annual Flores de Mayo celebration in the Philippines. While some of the suspects denied pushing drugs, others admitted doing the crime due to poverty. Defending the public shaming, Halili insisted that the suspects were given warning prior to the incident via mail delivered to their residence. The city mayor also emphasized that the suspects were caught in the act so the Commission on Human Rights cannot consider them innocent. Moreover, the Tanuan anti-crime group claimed that they have recovered drug money as well as illegal drugs and paraphernalia during a buy-bust operation carried out today. They also said they have evidence such as photos or surveillance video footage against the suspects. On May 18, Halili made seven alleged drug pushers walk around the town market wearing the same sign. However, the suspects claim that the charges against are yet to be proven. Moreover, the incident earned the ire of the public as three of the suspect are minors: a 14-year-old girl, and two 17-year-old teens. Jacqueline de Guia, director of CHR Region 4A and B, described the walk of shame as a form of mental torture. “We believe in the rule of law and the suspects must be punished for violating the rights of other people. It just has to go through the process,” de Guia said. Despite criticisms, Halili, a self-confessed fan of presumptive President Rodrigo Duterte, vows to continue the practice in Tanauan.